In this thread i will post tutorials that i will make from time to time. The tutorials will be very short and fast, no more then 3 minutes. Highlighting a specific subject, and accompanied by that patch for download. Hopefully this will be useful for anyone. Confusing Simpler - stretching/shrinking control voltage over time. In this video we will look at how to stretch and shrink control voltage over time. but you are free to choose any sequencer that will work for you and gets the job done. It is important to remember that recording will start first, therefor make sure that Confusing Simpler starts exactly at RUN. You can hit RESET if necessary. Really nice idea for a video series… BTW where’d you get all those dark skins? I edit the module graphics, you can do this with Inkscape. 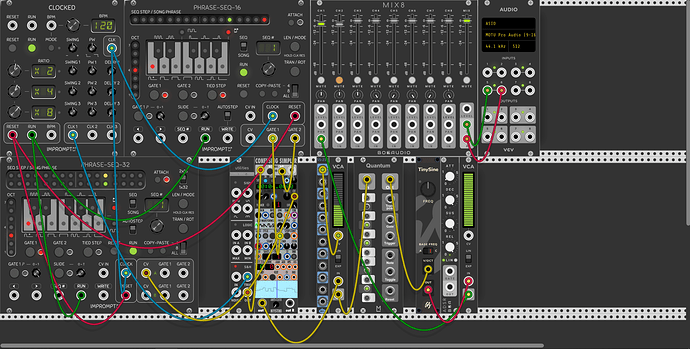 When I will get to it, I’ll update the Bogaudio module graphics again, and share them on github. In this short clip you can view how to create a so called (Buchla) bongo patch. The aim is not to create a realistic sounding bongo, but a sound that reminds of the bongo. It can also be used to create ringing bell like sounds, and a lot of other cool stuff! there are many other better ways of doing this. Feel free to post a comment below and post your creative patch ideas!